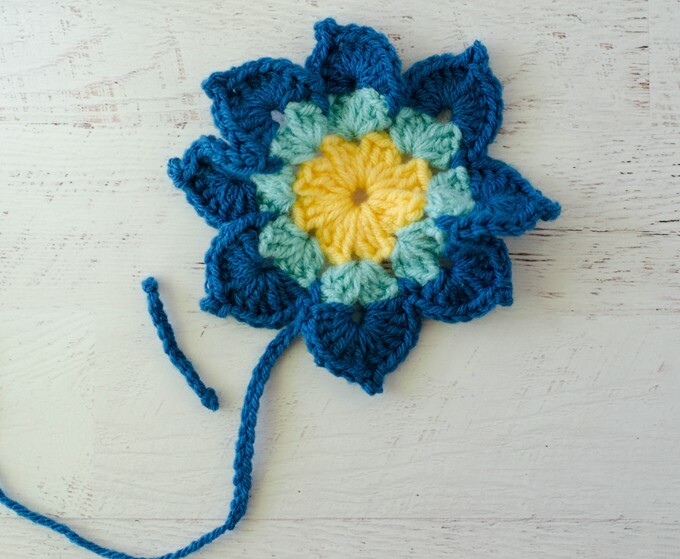 One of the first things I ever crocheted for my first home was a butterfly. I put a magnet on the back and it graced my refrigerator for a long time. It is long gone now, probably lost among some odds and ends misplaced during a move. Fast forward a few decades and here I am crocheting butterflies again. 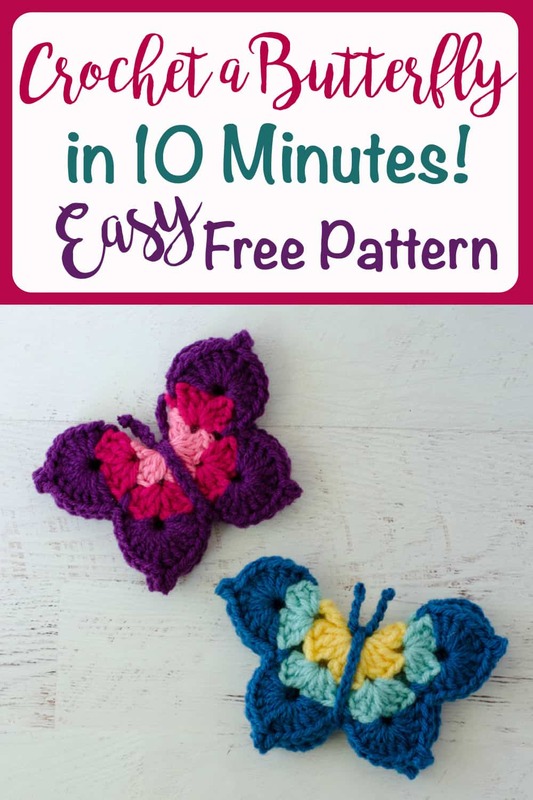 This free crochet butterfly pattern is so fun to crochet and very fast to put together. Any scraps will do. It is like a ruffled granny square with what seems to be way too many stitches, but at the end, when it is folded back upon itself…it’s magic..and a butterfly appears. I added some simple chain for the body and antennae. It would be great as an embellishment on a wreath or a wallhanging. In fact, if you already own one of my crochet wallhanging patterns, this would be a great variation to the pattern. 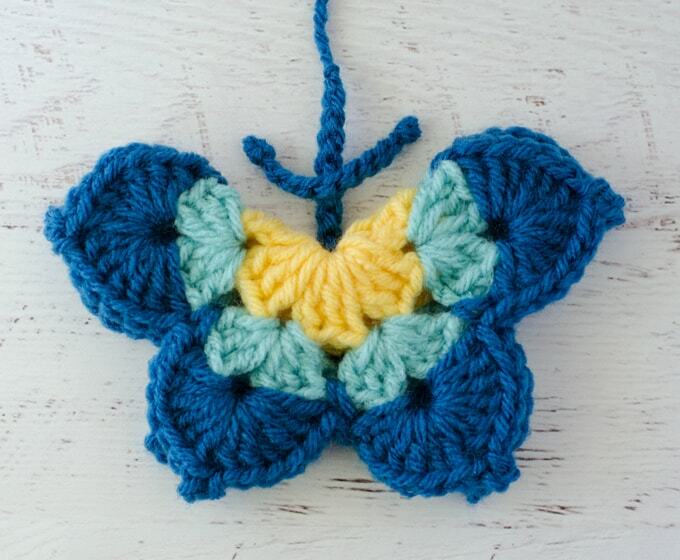 And, of course this crochet butterfly would be lovely as a magnet for your refrigerator. With color 1, chain 6 and join to form a ring. Row 1: Work the following in the loop: Ch 3 (counts as 1st dc), 2dc, ch 2, *3 dc, ch 2*, repeat * to * 6 more times (8 clusters). Join with sl st to top of starting ch 3. Fasten off color 1. Row 2: Attach color 2 in any space. [ Ch 3, 2dc, ch 2, 3 dc] in same space as joining, *in next space work [3dc, ch 2, 3 dc]*, repeat * to * 6 more times. Join with sl st to top of starting ch 3. Fasten off color 2. Row 3: Attach color 3 in any ch-2 space. In same space as joining, work [ch3, 5 dc, ch 3, sl st to 1st ch (picot formed), 6 dc], sl st in next space, *in next ch-2 space, work [6dc, ch 3, sl st to 1st ch (picot formed), 6 dc], sl st in next space*, repeat * to * 6 more times. Join with sl st to top of starting ch 3. Do NOT finish off. Carefully fold butterfly in half. Chain 15 or enough chain stitches to wrap around the fold for a firm fit. Do sew down just yet. Fasten off, leaving a long strand for sewing. Chain 14. Fasten off and tie a knot on each end of chain. Pull yarn tight and cut close to the knot. Wrap body chain up and around the body, catching the antennae under the chain at the top. Sew down firmly. And it is done! 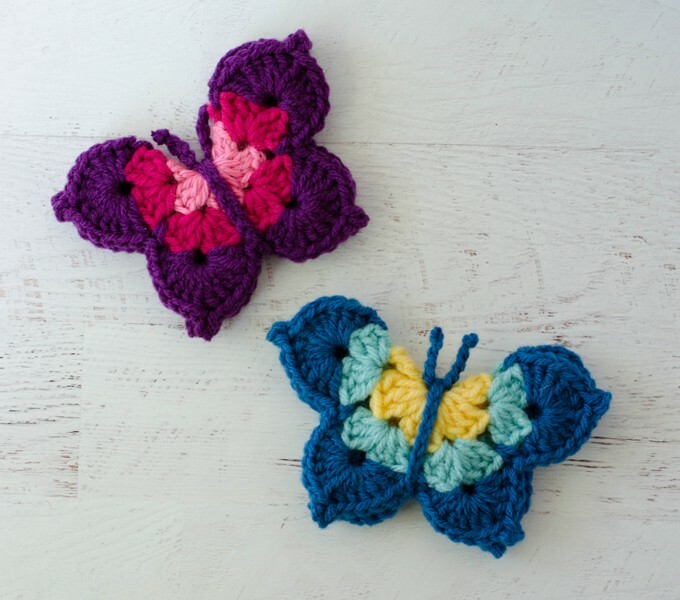 A crochet butterfly pattern that is fast and free. What could be better than that?! I used a small hook and attached some hair ties for my granddaughter to wear in her hair. She loves butterflies! Thank you!